“Heathrow: The Journey”, a new free exhibition focusing on the history of the airport, has opened at the University of West London’s campus in St Mary’s Road, Ealing. It features a wealth of never-before-seen items from the airport’s archive. 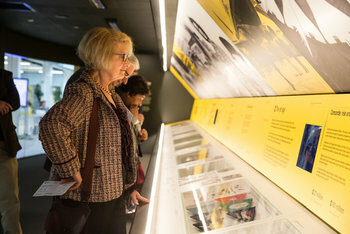 Housed at the university, the exhibition is open daily to the public and is free. It is at the ‘Heartspace’ in the University of West London, St Mary’s Road, London W5 5RF. The archive is open seven days a week from 10am to 5pm. You can find out more here on the University of West London website. The two-in-one InterContinental and Crowne Plaza at Dubai Festival City has long been a good stop for anyone looking for a high quality hotel near Dubai International Airport. As well as being only a short taxi ride from the terminals, we have often done our first night or last night of a holiday there as a money saver. Paying for an expensive beach-side resort when you are arriving at midnight or checking out at 7am for an early flight is a bad deal. A new 508-room Holiday Inn Dubai Festival City opened this week. It is a good deal for anyone who likes the location – and the massive mall and leisure complex of Festival City – but wants a cheaper IHG option. It has three food and beverage outlets, a rooftop bar and a pool and fitness centre. As an IHG Rewards Club redemption you will pay just 20,000 points per night. This is great value compared to the Crowne Plaza (45,000 points) and the InterContinental (50,000 points). You can find out more about the hotel on its website here. I mentioned this deal in passing in our Starwood article on Friday but I wanted to flag it again for anyone who didn’t read that. You can currently buy Starwood Preferred Guest points at 35% off in a new offer – the link is here. 30,000 SPG points will cost you $682.50 (£480). You need to do that via this page before 31st May. Also, buying SPG points on this promo, then converting over to AA attracts the two bonuses at present. Marriott Travel Package still a better value, if you can use Hotel Voucher. OT but relating slightly to the Heathrow exhibition, did anybody buy anything from the T1 auction yesterday? I was quite pleased with two 1960s/70s bench-type seats I bought for the house but really wanted the OneWorld sign which went for £1300! I know – prices were crazy, weren’t they?! I’m assuming companies were buying much of it for factory displays / nightclubs etc. Would have been nice for the Average Joe to pick up a souvenir though. Oh, and shipping (over £100 on some pieces)! I second the Featival City location. We stayed at the CP for a 2 night cash stay after doing a 5 night redemption at Hilton Jumeirah Beach. Was chosen primarily for cost reasons and wasn’t expecting much but thought it was fantastic. Great views overlooking the creek, really nice pool area (much better than the Hilton) and the mall area with the light show at night was really good. Also a MASSIVE supermarket in the mall selling everything you could want. All in all a great option if you can’t afford the sometimes ridiculous prices in JBR. I too might give the Holiday Inn Festival City a try. On a side note does anyone have a list of Holiday Inn’s with an Exec Lounge? I needed an Asia Pacific stay for last years Accelerate. My mate who lives in Thailand did a stay for me at the HI Pattaya and he said the Exec lounge was excellent. I have just booked a BA J ticket to NRT for myself and my other half in Feb 2019, but using CX miles. I have no status with either CX, BA or any other OW carrier. Are there any cunning workarounds that would allow me to book seat assignments for myself and the missus WITHOUT paying for the privelege? I suspect not, and would be prepared to pay, of course, but would rather not should there be a cunning workaround that would do Edmund Blackadder proud. No. Only way is to gain status. Cruz said you may be able to use avios in future. Rob – you might want to update the LHR article with the web link? I’m in the process of earning my 10,000 SPG points on the Amex. This will take me 11,000 including the spend of £1,000. Is it worth me buying the remaining 9k from SPG at 35% off to make up the 20k to get the 5,000 bonus Avios? Why don’t you run some numbers? Without even calculating anything, I wouldn’t. SPGs are too valuable to convert direct to avios. Still looking into this and just to make sure I’m not missing something obvious…. I’ve got a stay in London next month and the Marriott Park Lane has a redemption for 45,000 MR points or the cash rate is £543. if I buy 15,000 SPG points at circa £250 then convert to 45,000 Marriott points I’m scoring a good deal there? Certainly looks more generous than other redemptions. Yes, in those circumstances it definitely makes sense.